AS A KELOWNA KID, Jessica Van Brummelen loved taking apart old remotes and calculators to figure out their inner workings. When she enrolled at her hometown School of Engineering, she was in for a nice surprise. Why Mechanical Engineering? Flash forward to September 2017: Van Brummelen will start a Masters/PhD program in Electrical Engineering and Computer Science at one of the most prestigious universities in the world, the Massachusetts Institute of Technology (MIT). 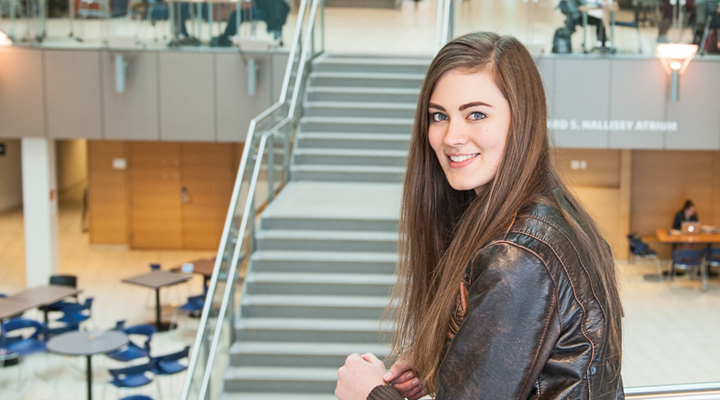 “I never knew how much I would enjoy writing computer code, building robots, and researching sustainability or autonomous systems until I came to UBC,” she says. In doing so—with supportive professors and student clubs along the way—she’s worked on an educational video game to help promote sustainability in BC; researched environmental engineering in Sweden through UBC’s study abroad program; helped demonstrate the wonders of physics and computer science as a teaching assistant; programmed a giant robotic arm to mimic human motions; and “made some pretty incredible friends through it all,” she says. “Not only is it a beautiful campus,” Van Brummelen says, “but UBC Okanagan also has a tight-knit community, a wealth of opportunities for undergraduates and graduate students alike, world-class education, and professors who care deeply and take time to reach out to get to know their students. Apart from involvement in such student associations as the Mechatronics Club, Concrete Toboggan Club, and Women in Science and Engineering Program, Van Brummelen took advantage of a Go Global summer research scholarship in 2014. “Engineering school isn’t only about solving equations, completing interesting projects and learning about how the world works,” she says, “it’s also about learning who you are as a person. A variety of experiences, new perspectives, and relationships has whet Van Brummelen’s appetite for the world of engineering at UBC.